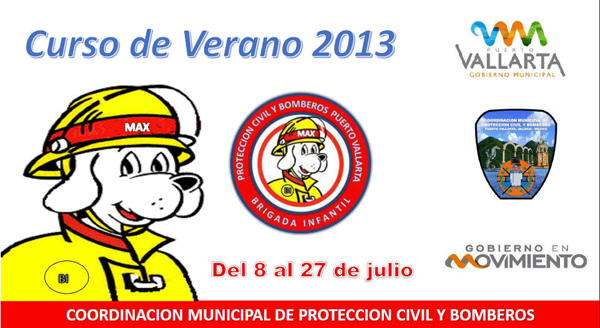 As every year since 2008, summer courses continue at the Puerto Vallarta Fire Department. As in other years, the themes of the courses are directed at fire and civil protection, including participation of the Police Academy group of DARE. Once again, our heroes at our Puerto Vallarta Fire Department, our Bomberos, are doing amazing work with the Summer Program at the station. Beginning on July 8, the children and young adults between 8 and 16 years of age are being instructed on many topics to educate them in improving their knowledge of important issues, emergency procedures and environmental awareness. The classes will continue until Saturday, July 27, with the closing exercises. • Civil Child Protection - Interactive program through the internet link to Government Civil Protection. It contains basic information which is the national system of civil protection (SINAPROC). The objective is to introduce minors to the knowledge of civil protection, its structure and functions. This training is an interactive classroom with projector, computer and internet, with notebooks for the students to take additional notes. • Family Plan Civil Protection - Demonstration and interactive presentation program (making a family plan) contains information for steps of the family plan in detecting and reducing risks in the home, plans for evacuation and making decisions in an emergency. The objective is to instruct minors in the family unit of steps to take during and after a disaster with the knowledge of basic preparation and self-protection measures. Each participant prepares their family plan. • Basic First Aid - Demonstration and interactive presentation program containing information for providing immediate help to a person that has suffered an accident or sudden illness. The training objectives include the technique of CPR, how to contain hemorrhages, caring for wounds and burns, immobilization of fractures, and types of transport for the injured. At the end of the course, the child will be capable of giving CPR, controlling bleeding, treatment to wounds and burns, and applying fixed assets in fractures. • Fire Prevention - Demonstration and interactive presentation program, contains information for the prevention of fires in the home. The objective is that by the end of the course, the children will have learned 8 important lessons about fire prevention, in order to prevent accidents and/or burns. The information includes steps for fire prevention, assessing risk situations, classification and use of a fire extinguisher. • Ecological Protection - Environmental education aims to change attitudes and behaviors in steps to improve our living relations. This course not only focuses on promoting the knowledge and sensibilities, but also the transformation of reality, educating the citizenry to take part actively in the process of change towards a better world. The Fire Department believes in preventing and safeguarding the good and goods of the civil society of any natural environments. This course teaches about the ecological environment today and how to interact for the preservation of nature when sharing the common spaces with people. • Aquatic Environment Protection - This program integrates and presents the use of equipment by lifeguards including theoretical information, preventive practices and proper conduct in the pool and ocean. The participants learn how to activate the emergency system through CARE, provide the necessary information for this purpose, and contribute with the lifeguard in his rescue, if necessary. The course consists of 5 hours of activities with group practices in the ocean and learning to use the necessary equipment such as the lifesaving vest, swimming goggles, fins, and rescue torpedo. We applaud our Puerto Vallarta Fire Department for instructing our children and youths with the knowledge of improving lives in our community.